This book received a lot of attention when it came out in 2005 and sold three million copies worldwide. There were much commentaries everywhere claiming it had an extraordinary observation on many everyday life activities. Some startling quotations were circulated. But I never really took a serious look at the book. The craze went quiet after a few years. And then I found this paperback selling at a big discount. The content is more enjoyable than it looks. The sub-title of the book is A Rogue Economist Explores the Hidden Side of Everything. 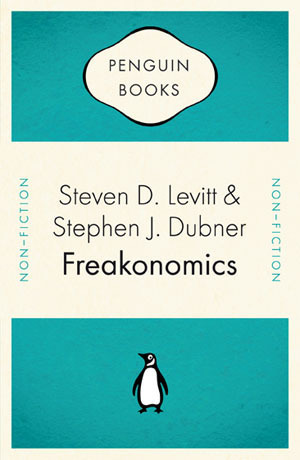 It is co-authored by Steven Levitt and Stephen Dubner. Levitt is the economist. The book is based on some of his academic articles, re-written by Dubner who is a journalist, into easy reading. While there are many interesting stories, I just take notes of a few topics of interest which in particular are controversial. Praise and criticism are mixed, depending on the value judgment of the readers, as well as their vested interest. Many of the ideas in the book are actually challenging conventional wisdom. As explained in Chapter three, this term is often credited to the economist John Kenneth Galbraith who used it in 1958. The original intention of the term is not a compliment. Conventional wisdom is made of ideas that are convenient, appealing and assumed by the public. It has a property that opposes the introduction of contrary belief, to the point of absurd denial of the new information. To me, conventional wisdom is simple. They are supposed truth that your parents, teachers, priests, or bosses told you. They are not all delusions. In fact, there is a possibility that some of them are really true, within a special circumstance which may already be outdated. Conventional wisdom cannot be believed just for granted. They have to be thought through to see if they could be logically applied in the present tense. When this process is completed, the real truth will migrate from the realm of conventional wisdom into modern wisdom, or your own wisdom. During a period of 15 years from 1975 to 1990, violent crime in USA rose by 80%. The situation was so bad that many sociologists predicted that the trend would worsen to an uncontrollable level. But starting from 1990, the crime rate started falling. it fell suddenly and with great speed that caught everyone by surprise. Naturally many parties came out to claim credit, including better policing, stricter penal term, better drug control, stronger economy, etc. Levitt did a research on these but none of them correlated. Al last, it boiled down to Roe v Wade which was a landmark case leading to the legalization of abortion in USA in 1973. Since then, there was an average of 1.6 million abortions per year. The theory was that these 1.6 million unborn children could have been potential criminals in their adulthood in the 90's. Many new blood criminals were just simply not born, thus resulting in a drop in crime rate. This statement was severely criticized by the conservatives as well as the liberals. While many people including the religious people said this was a theory supporting the immoral abortion, the liberals was saying that this was a bias towards blacks and the poor who were more likely to have abortions. All are missing the point that what Levitt did was only a research of economics and sociology. His theory was: the women most likely to seek an abortion were the very women whose children, if born, have been shown most likely to become criminals. In very simple term, he said "Unwantedness leads to high crime; abortion leads to less unwantedness; abortion leads to less crime." There is no moral nor racial judgment. If you really want to know what makes a perfect parent, just note the sub-title of this chapter: Do parents really matter? Parents have two roles: the nature which is the gene as well as their family and education background, and the parenting which is the nurturing of the child. Levitt did some in-depth data mining in order to correlate these factors with the success of the child in school results. His data mine was the records of twenty thousand children under the ECLS Early Childhood Longitudinal Study in the US conducted in the late 1990's covering the progress of these children from kindergarten to the fifth grade. The data set included the test scores of the children and data collected through interviews with parents. Family background as well as parenting behaviour were recorded. The result: The background of parents correlated with the progress of the child, while parenting behaviour did not. There is a gap termed nature-nurture discrepancy. Good parents may have good children and vice versa; but good parenting may not have good children, similarly vice versa. Parents do matter. But the bad news to parenting experts is that most of the things that matter have been decided long ago: who you are, whom you married, the kind of life you lead. If you are smart, hardworking, well educated, well paid, and married to someone equally fortunate, then there is a better chance that your children will succeed. But it isn't so much a matter of what you do as parent; it is who you are. Levitt drew an interesting comparison: An overbearing parent is like a political candidate who believes that money wins elections. In truth, all the money in the world can't get a candidate elected if the voters don't like him to start with. But if not parenting, what influences the child most? There is another theory by the psychologist Judith Harris. She argued that parents are wrong to think they contribute so mightily to their child's personality. This is a cultural myth. Actually, top-down influence of parents is overwhelmed by the grassroot effect of peer pressure, the blunt force applied each day by friends and schoolmates. But surely parents must matter. Even if peers exert so much influence on a child, it is the parents who essentially choose a child's peer by choosing the right neighbourhood, the right school and the right circle of friends. Some good parents did.